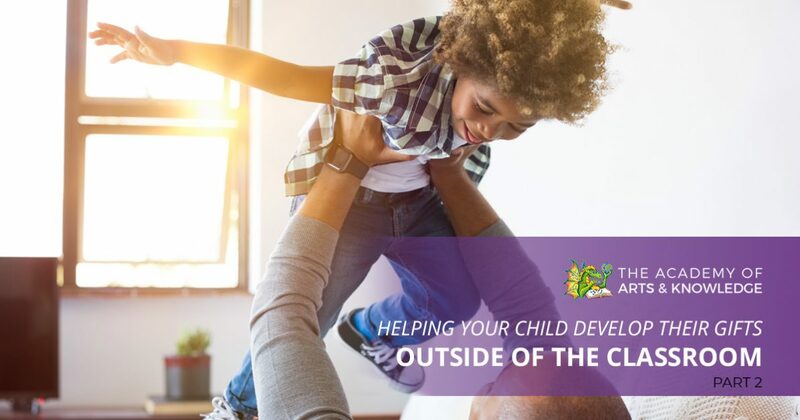 In part one of this blog series, we discussed the importance of helping your child continue to develop their gifts when they aren’t in school. Today, we want to talk more about encouraging and supporting your kids as they continue to grow as artists, dancers, musicians, or in other creative and athletic endeavors. If you want your child to attend a charter elementary school that is dedicated to providing a well-rounded education with an emphasis on the fine arts, The Academy of Arts & Knowledge in Fort Collins is the right school. Learn more about our school by browsing our website, schedule a tour, or start the open enrollment process for the 2019-2020 school year. As a public school, we are open to all Colorado students. This may sound unsupportive, but it is important that you learn when it is the right time to praise or reward your children for pursuing things in which they are interested. This doesn’t mean that you should not congratulate them for achieving their goals or accomplishing something difficult, it means that because not everything they try will be a success, they shouldn’t be rewarded simply for trying something. By rewarding a child for everything, they will come to expect it for everything they do, even if it requires no effort, or they stop doing something before they finish. If your child shows an aptitude for art, music, or athletics, then you want the process of learning and improving to become the reward, not external encouragement from you. In order for them to continue to grow, they will have to decide whether their feelings about art are enough for them to want to keep working at it. One of the easiest, and most fun ways to keep your child engaged with their gifts when they aren’t in school is to have them teach you about the things that they are learning. Maybe this means that they sit down and play a new song that they’ve learned, or they talk to you about a new technique they learned for painting. Letting them explain the process, or actually showing you how to play a song or paint a picture, will help reinforce what they’ve learned, and it will give them a deeper understanding of the subject. If you want your child to be immersed in the arts from a young age, The Academy of Arts & Knowledge in Fort Collins offers a full curriculum that meets all of the Colorado Academic Standards while presenting many opportunities to engage with the fine arts. We believe that art has a vital place in education, so we try to bring it to the forefront as much as possible. Contact us today to learn more about our charter school, or to begin enrollment for the 2019-2020 school year. Starting in the Fall of 2019, The Academy of Arts & Knowledge will offer free before- and after-school care for all enrolled students!